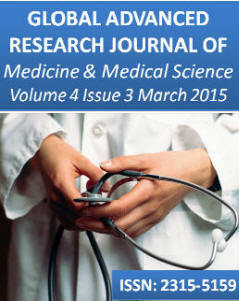 Global Advanced Research Journals! Welcome::::::GARJMMS>Yıldız et al: Does Vitamin D Level Effect the Response to Intravitreal Ranibizumab Therapy for Diabetic Macular Edema ? Does Vitamin D Level Effect the Response to Intravitreal Ranibizumab Therapy for Diabetic Macular Edema ? Vitamin D deficiency is considered as an independent risk factor for retinopathy in patients with type 2 diabetes mellitus (DM 2). We investigated the relationship between 25-hydroxy vitamin D (25-OHD) levels and response to intravitreal ranibizumab injection indicated for diabetic macular edema. The records of 34 naive patients with non-proliferative diabetic retinopathy and diabetic edema who underwent three intravitreal injections of ranibizumab (1 mg each injection) administered on day 0, month 1 and month 2 were analyzed. Anthropometric data, serum HbA1c, 25 hydroxy vitamin D (25-OHD), parathyroid hormone, calcium, phosphorus, C reactive protein (CRP) and (total and high density) lipoprotein cholesterol levels were collected. All subjects underwent standardized ophthalmic evaluation at baseline and at month 1, 2 and 3 including visual acuity (VA) measurement and imaging with ocular coherence tomography (OCT) evaluating changes in central retinal thickness (CRT). Stereocolour fundus photographs and fluorescein angiography was performed to evaluate macular edema and exclude patients with proliferative retinopathy. Twenty-nine study participants had a deficient or insufficient level of serum 25-OHD concentration (less than 50 nmol/l). There was no statistically significant relationship between serum 25-OHD, parathyroid hormone, calcium levels and (anatomical or functional) success of the treatment. Serum phosphorus levels positively correlated with anatomical success (p<0.05). High levels of HbA1c and body mass index (BMI) negatively correlated with anatomical (CRT) and functional (VA) success rates consecutively (p<0.05). The ranibizumab schedule resulted in a continuous improvement in mean BCVA and CRT (p<0.05). The levels of 25-OHD does not seem to affect the success rates of ranibizimab administered intravitreally for the treatment of DME. However most of the participants (85.2%) had deficient of insufficient levels of 25-OHD. Thus randomized controlled studies are required to demonstrate that 25-OHD supplementation in diabetics with macular edema will lead to improved outcomes of intravitreal ranibizumab therapy.